In order to communicate with others, people use language. They always share their ideas to the others. This also happens to the children under five years old. They use their first language to communicate with the people around them. In the age under five years old, the children have mastered at least 200-300 words. After getting their first language acquisition, they try to talk to the others. However, what the children speak or utter always depends on what they needed or what they wanted. In the other words, it is all about them, about their ego. The children under five years old will use their first language acquisition to get the attention of the people around them. They try to utter in the way that they know. In order to convey the children meaning or intention, they also show an act in their speech. This is called as a speech act. Speech act is the things which people usually do while they are speaking. 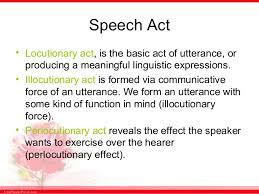 Speech acts also known as the minimal unit of speaking. Besides showing the act of their speech, the children under five years old also use strategy in their speech. The following is the example of the speech of the children. The following conversation is the ??????????? Belum ada tanggapan untuk "THE SPEECH ACT AND COMMUNICATION STRATEGY IN CHILDREN OF 3-5 YEARS OLD"